The Olmec priests, shamans and rulers all used mirrors for religious ceremonies. Within the Olmec society, the mirror was strongly associated with the sun. The Olmecs created the earliest known major civilization in what’s today known as Mexico. 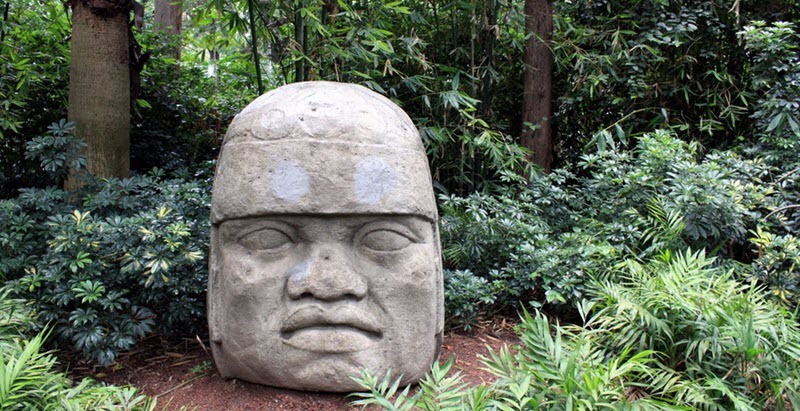 The Olmecs lived in the tropical lowlands of south-central Mexico (present day Veracruz and Tabasco). Flourishing from circa 1500 BCE to about 400 BCE, the Olmec culture laid many foundations for the civilizations that followed in Mesoamerica. During archaeological excavations that took place in the early 1940s, mirrors produced and used by the Olmecs were unearthed. It took a while however, before they were recognized as such. An excavation directed by Matthew W. Stirling at La Venta did for instance discover both a mirror and a mirror fragment in 1942, without anyone realizing what it was. In 1943, a complete mirror was found at the same site, and now the archaeologists understood what they were dealing with. Eventually, even more mirrors and mirror fragments were found at La Venta, including two mirrors of supreme quality that were unearthed in 1945. Several dozen Olmec mirrors made from iron ore have been found, but only a few of them were unearthed at secure archaeological excavations. Concave Olmec mirrors were created out of a single pied of iron ore. Concave mirrors can be seen depicted in Olmec art where they are typically worn as a pectorial on the bearers chest. One of the most well-known mosaic mirrors of Olmec origin was found at Las Bocas, an archaeological site in the Mexican state Puebla. This mirror has be dated to around 1000 BCE. At Tomb A at La Venta, elite individuals of Maya society were burried with numerous offerings. Among these offerings, archaeologists have found a highly polished magnetite mirror and a the figure of a seated female who wears an obsidian mirror on her chest. Tomb A is one of the oldest formal tombs in Mesoamerica, dating to circa 600 BCE. In total, seven concave mirrors have been unearthed from Complex A at La Venta. They were mostly made from hematite, ilmenite and magnetite, and their concave lenses had been very pricesly ground – just like modern optical lenses. (While the backs of the mirrors had been left rough.) When tested, these concave mirrors turned out to be parabolic reflectors. Of four large mirrors found at Arroyo Pesquero in Veracruz, Mexico, two were circular ones that proved to be very effective at lighting fires. Within Maya society, mirrors were expensive and not for anyone. They were produced by highly skilled experts and some scholars have argued that these artisans might have been members of the aristocracy or even royalty. In Maya art, mirrors are usually depicted as handheld but there are also examples of mirrors being mounted on stands or even held by dwarfs (!) in front of the user. Maya script has revealed that mirrors were used for ritual scrying by the Mayan priesthood. Scrying is the practice of looking into a suitable medium, such as a mirror or crystal ball, to detect supernatural messages or visions. Among the Mayas, this ritual scrying had its roots in preclassic shamanistic rituals. Mirrors have been found in Mayan tombs, often placed close to the deceased, e.g. on the chest, near the head, in the small of the back, in the groin area, or by the feet. More seldom, mirrors have been found on the floor at some distance from the body. The oldest Maya mirrors have been dated to the Middle Preclassic (circa 600 BC). The creation and use of mirrors by the Maya then continues through all the other periods of the Maya civilization. Based on archeological remains, peak usage seems to have been reached during the Early Classic period in the highlands and in the Late Classic for the lowlands. It is also interesting to see that a much larger quantity of mirrors have been recovered from the highlands than from the lowlands. Kaminaljuyu and Nebaj in the Guatemalan highlands are two examples of sites where a large number of Maya mirrors have been discovered. It is possible that some of the highland sites were production centers from which mirrors were distributed to the rest of the Maya region through trade networks. 1.1 Who were the Olmecs?